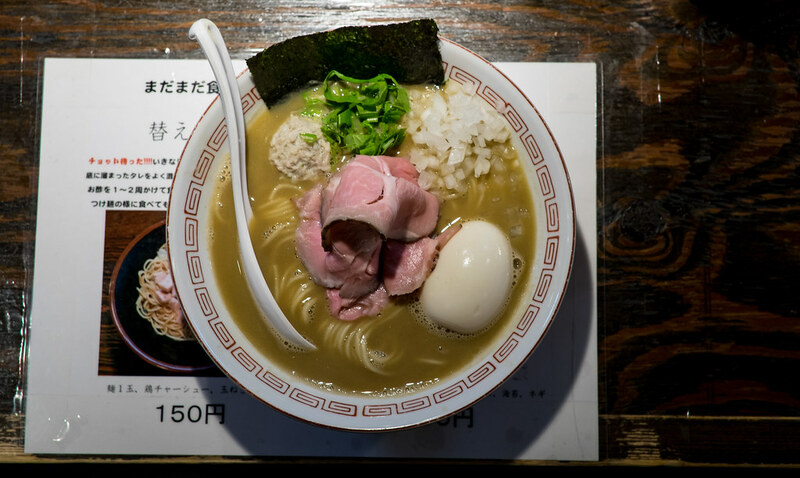 These 14 shops are the definitive, best-of-the-best ramen shops in Tokyo in 2016. Of course, I'm not being serious. The above was a one-day New Years pop up from Nishio that you will never be able to try, though they will probably have another one in January 2017. What I did was go through all my posts from 2016, a handful over 100 shops, and chose the ones that I consider true standouts. I have other, more organized best-of lists here and here, but this list could be considered a legit collection of must-crush bowls. I'll link to the individual reviews. Shops are in chronological order. Simply noodles and soup. If simple means abalone and spiny lobster, and noodles made with a touch of rice flour for a stronger texture. Tanaka Second changed their menu, so you can no longer get this particular kakesoba. 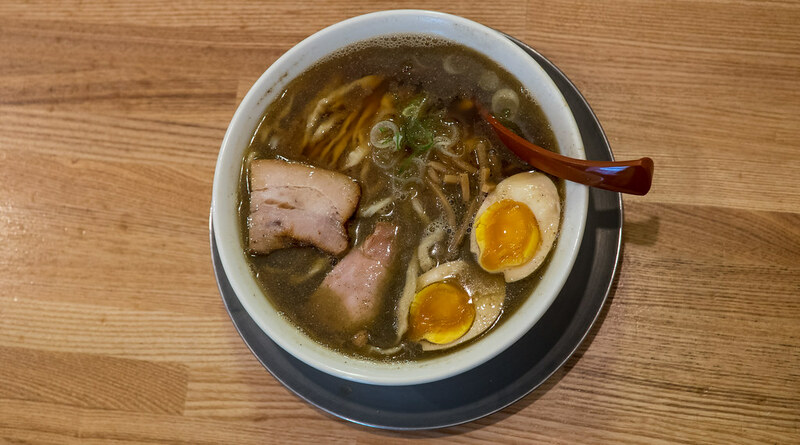 Solid bowl with standout toppings, including an egg that has been soaked in katsuo broth. Sorry, another limited bowl. Lamb soup, fragrant spices, and bitter chocolate. Keep in mind that many shops to a Valentine's gentei; a limited bowl with chocolate. Kintoki's light shio ramen is great, but I was blown away by their excellent tantanmen. Another great spicy bowl. Yamaguchi's second shop had some big hot and numbing flavors. Not sure if I should post this. Muginae was poised to be the rookie shop of the year, but they rejected all media, including magazine awards. One of the most premium bowls in Tokyo. An old school legend. Noodles made with bamboo poles, a technique almost nobody uses anymore. I've always loved Shichisai. 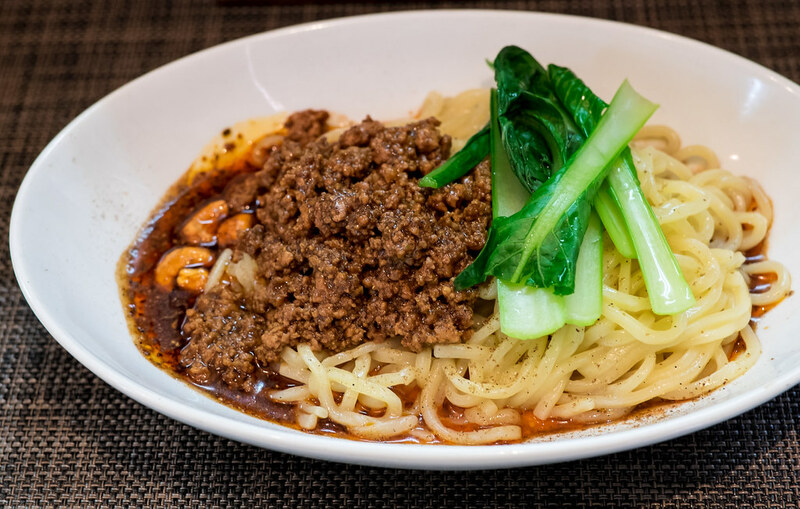 Their new shop takes things to another level with handmade noodles. They literally mix flour and water in front of your eyes, and go from there. The king of niboshi lived up to all the hype. Rich, smoky, and slightly bitter. Heavier-than-average tonkotsu. Instead of extra noodles, go for zosui, a rice dish to dump in the left over soup. 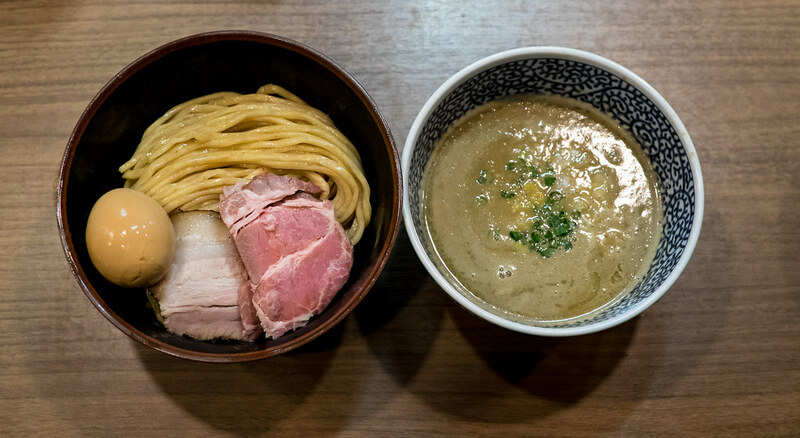 Near-perfect execution of tsukemen. This style is abundant, but the big names you might have heard of are all franchises now. Miyamoto is legit. 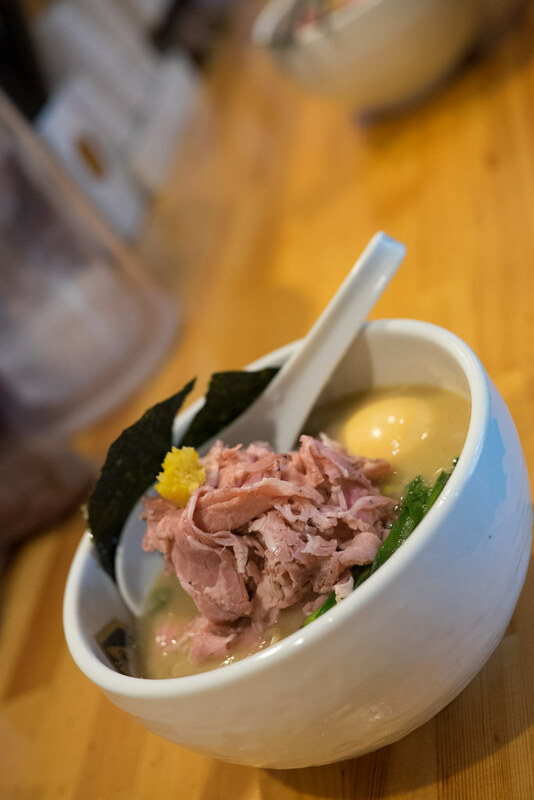 Fancy ramen made with sake lees, a byproduct of sake fermentation. Another Ginza shop that came out of nowhere. Smoked chashu on a fish soup with a dashi-infused egg. This shop was the rookie shop of the year winner in multiple categories. I didn't even plan on attending the 2016 Tokyo Ramen show this time around. I was busy with other things, and had just finished with the Grand Tsukemen Festival, where I had 38 of the 40 available bowls. I was festivalled-out! But then the usual suspects, the raota, the ramen nerds, told me to come down. From ラーメンまこと屋 (Makotoya) in Osaka came this creamy paitan ramen blended with a beef soup. 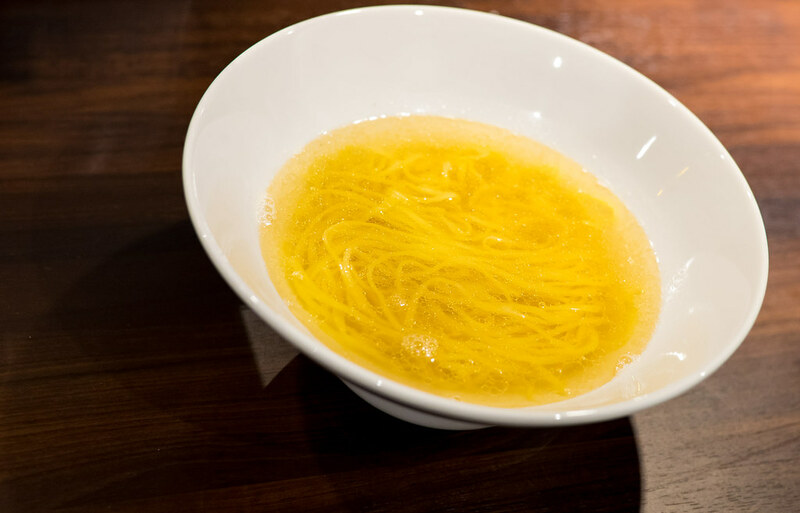 The sweetness from the beef stock was thinned by the thicker soup, if that makes sense. Fantastic. This one from always-excellent Tomita used 山水地鶏, a brand of chicken considered by many as the best of the best. It was ok, nothing out of this world. Nice to try something different, I guess. Just two bowls for me this time, and I'm fine with that. 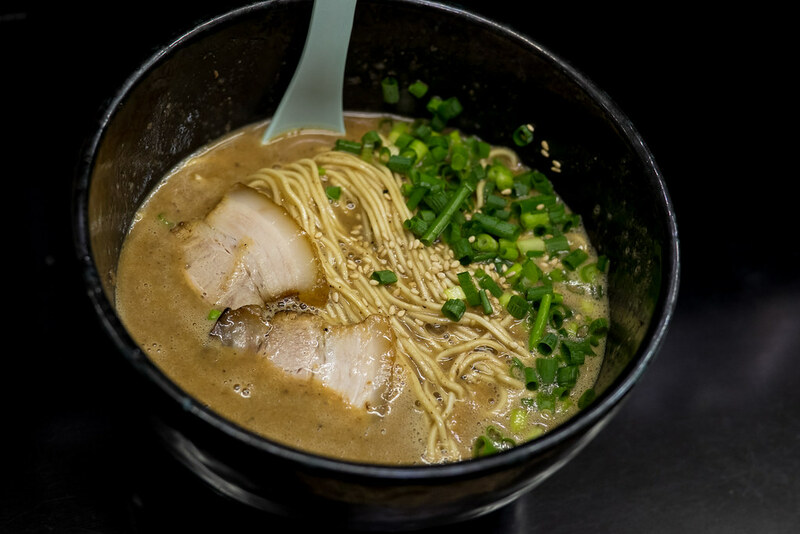 One of the ramen otaku there with us has been to every festival in Japan this year, sometimes traveling an entire day just to slurp and return. Good luck hitting 1000 shops this year! For location and dates, please refer to their official site here. 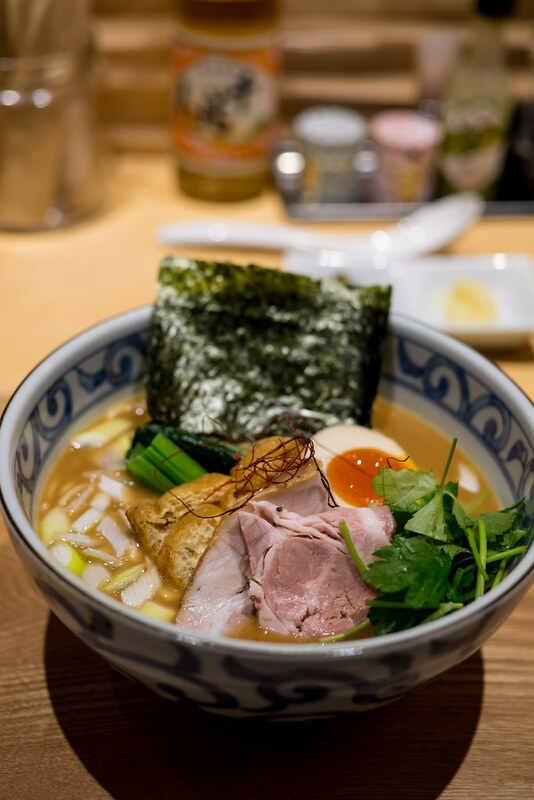 Yoshikawa in Saitama is one of the best ramen shops within driving distance of Tokyo. With their recent success, they were able to open a second shop in Kawagoe, also in Saitama Prefecture. I was hungry and thirsty, and since I didn't do the driving, a glass of dassai sake would go nicely with a side of iwashidon - sardines on rice. 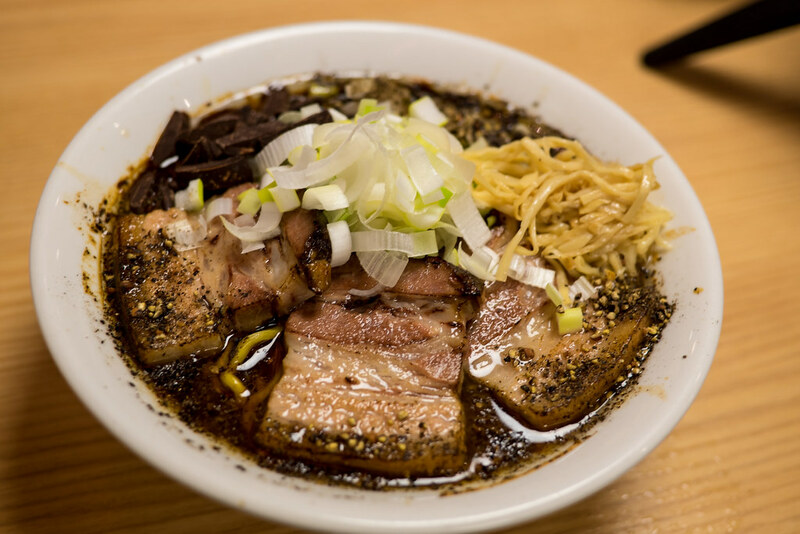 You can choose black or white ramen here, with the black being a bit deeper in flavor. Both are top of their class, but I say go for the darker version. It uses tamari shoyu, a stronger type seen a lot in Osaka. If sardines aren't your thing, they have a daily kaisendon - various raw fish over rice. The shop is quite large, with tables for the family, so you can linger a bit longer than you might at a small, counter-only shop in Tokyo. I noticed it late, but was able to change to have my sardines served over a small plate of noodles. The shop makes their own, and these fresh raw sardines, hit with lemon vinegar and onion, were a standout. Almost a meal on its own. The shop's ingredients are on display, including a premium tamari soy sauce. And an equally high quality craft soy sauce. A must-hit if you live in Saitama, and probably worth it for out of towners as well. I'd noticed Yasuo mentioned in magazines, on blogs, and even on a narrow search of highly ranked shops in my neighborhood. I've known about them for years. Why did it take so long? 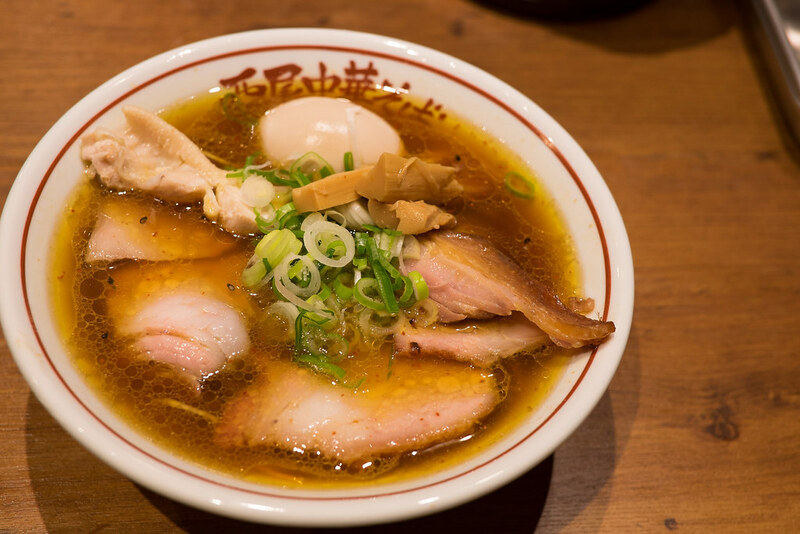 Well, they are in the realm of jiro-kei; shops that serve ramen in the style of Ramen Jiro. Jiro is not my cup of tea. Mainly because I don't like my tea to make me stink of garlic and rendered pork fat for the next 12 to 18 hours. I shouldn't judge, though. While the ヤスじろう option is strictly jiro-kei, the others aren't quite at that level. 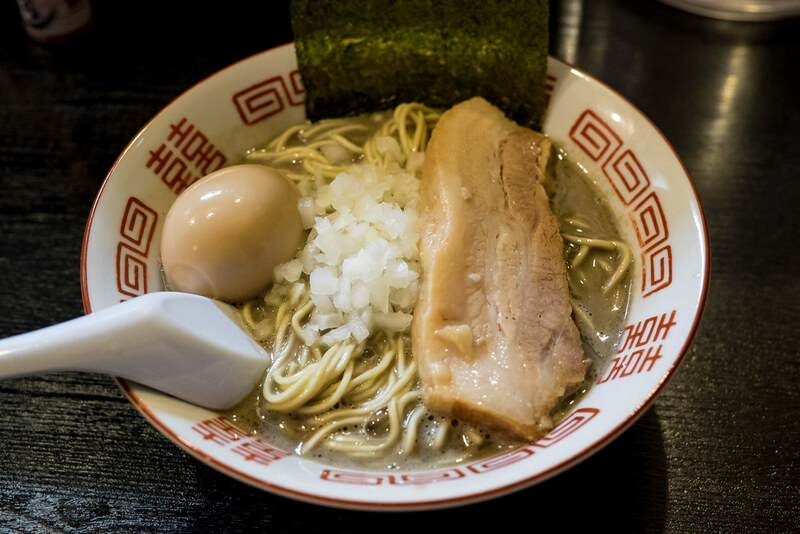 Go for ラうどん - ra-udon - if you like your noodles super thick, or ラそば - ra-soba - if you like them thin. Most people go with the thick ones, and most people come back. If this is jiro-kei, then it is officially my favorite bowl of that genre. The noodles are the bomb, and the soup intense but drinkable. Spinach greens play nicely with a very meaty bowl, giving it some healthy vitamins. 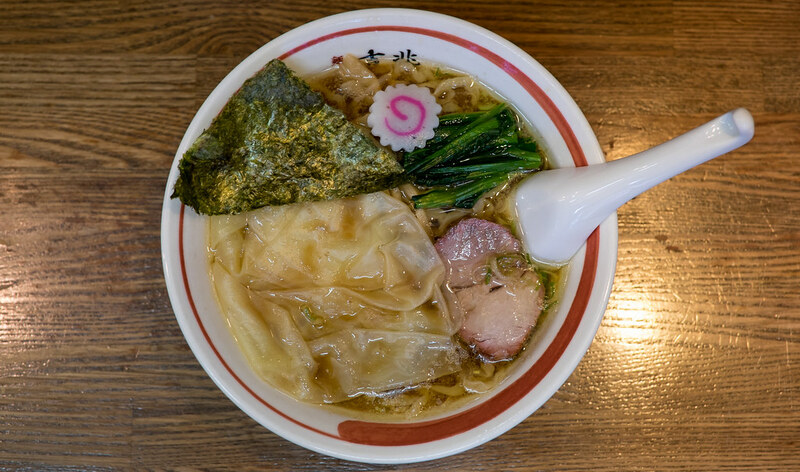 Most Jiro style bowls are covered with nutrient-lacking bean sprouts and cabbage. And as I had nothing to do the rest of the day, I added a bit of freshly minced garlic. Definitely recommended. A few weeks ago, I made it to the wrong 道. A common name (michi means road or path), and the kind of mistake a foreigner in Japan is apt to make. 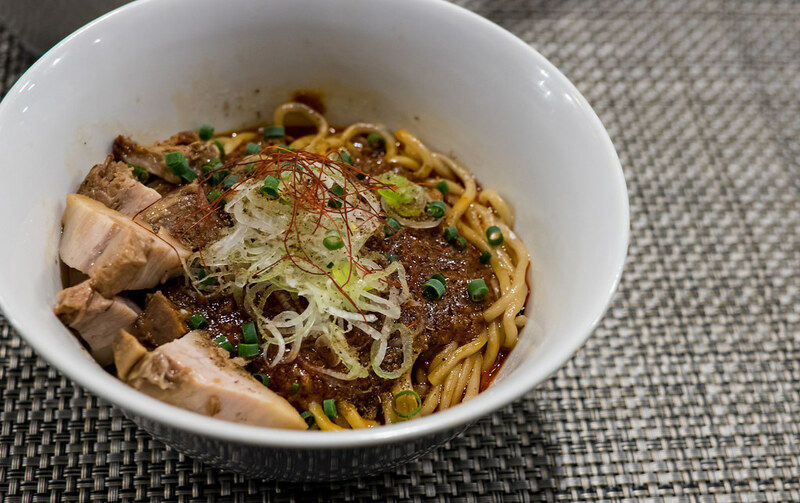 What I wanted was, apparently, the best tsukemen shop in Tokyo according to a few lists. So when I finally made it out to this shop, waited in the long line (a dozen or so before opening), and got ready for the best tsukemen of my life . . . I'll translate. 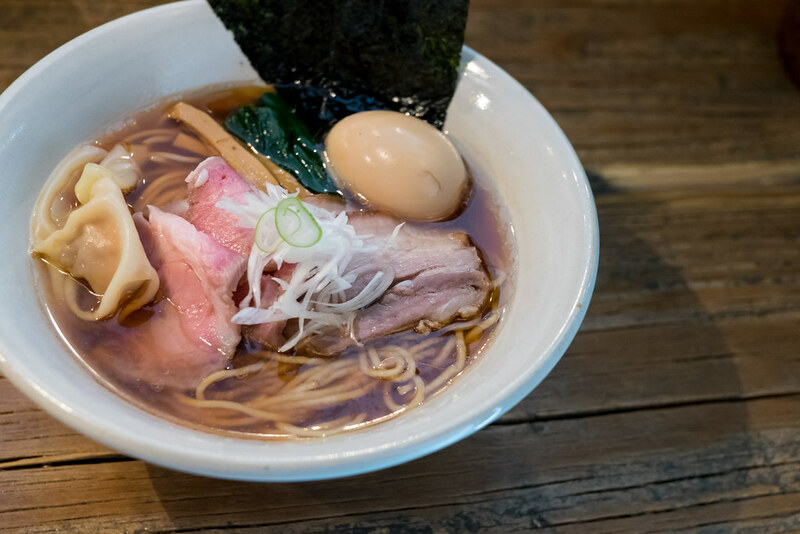 Today, we are only serving shio ramen. Yeah, sometimes they make a different menu, and people like me that didn't check their twitter account are left dumbfounded. In the end, though, a highly ranked shop probably makes a mean second brand, so let's dig in. They are going for something simple, with a solid balance. A good bowl, but not one I would make the trek for again. I was with a friend, a kid who worked as a chef at some of the world's top restaurants, and he was shocked at how creamy the soup was, using only chicken (chicken feet are the key, said the chef). Go for the special bowl, as it comes with some tasty wontons. The thick, creamy anindofu, a kind of pudding, was above and beyond acceptable as a desert. Open 11:30 until the soup runs out, usually around 19:00. Monday and Tuesday are shio ramen days. I know, I know, the above photo is positively disgusting. I believe I could have made it look appetizing if I had my Fuji XT-1 camera; this is the first post in ages that I used an iPhone for. But in my defense, I didn't think I would be eating ramen this evening, in the middle of nowhere Nagoya. But I have a star on my map, indicating a ramen shop that had somehow caught my eye, but was too far away for immediate action. My hotel for the evening was at the intersection of the bullet train and local, near Mikawa-Anjo Station. So that is how I ended up at Oiwatei. Why was this one on my ramen radar? What is so special? Thickest soup in Japan. Eccentric chef. Yes on both accounts. The chef screams as he shakes the noodles from the boiling water. Haaaaaaa! Eeeeeeeee! He also takes his sweet time. When I arrived, there were eight people ahead of me in line. Standard, and the usual formula is four minutes a person wait. But the master's screams came infrequently. It took me almost two hours before I could sit, and another 30 minutes before I was presented my bowl. Yeah, that is my spoon standing up in the soup. I remember old Dennison's chili commercials as a child boasting that you could stand a fork in the bowl. Well, this ain't chili, this is soup. Ungodly thick soup. *A quick cultural note: Never stand your chopsticks up in food in Japan, especially rice. This is done during a traditional funeral ceremony as an offering to the deceased. I asked a few people if a spoon was ok, and no one knew for sure. The general consensus is that it is fine. The above shot was taken by everyone who came here. This bowl was horrible. If I were judging on taste alone, then it would be a different story. The soup was like drinking a pig, which isn't necessarily a bad thing. Despite the wait, I'd say the novelty factor would put this one on a list of strange, yet interesting ramen in Japan. I might have actually come back. No, the problem was a serious one. On my first slurp, something sharp hit my tongue. Spitting it into a napkin revealed its nature. A shard of pork bone. Then another, and another. Each slurp had to be done with care, followed by the oral removal of real shattered bone bits. I stopped after five or six miserable bites, paid, and left.